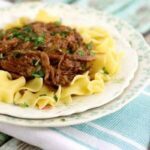 Easy old fashioned beef and noodles is such and easy recipe! Beef cooks in the slow cooker for hours until it's tender and full of flavor. Quickly cook the noodles and you're good to go. Season both sides of chuck roast with salt & pepper, rubbing it in gently. Heat oil in a large skillet until popping. Brown for 3 minutes, turn, and brown the other side. Oil the inside of your slow cooker. Pour 1 cup of the beef broth into the cooker. Add the guijillo pepper if you are using it. Cover crock pot and cook on low for 8 - 10 hours. Remove the celery and shred the meat with two forks about 30 minutes before cooking time is over. Replace the cover to the slow cooker. About 10 minutes before you are ready to serve dinner bring 2 cups of water and the remaining beef broth to a boil in a large pot. Add the 1/4 cup butter and the egg noodles. Drain and stir in the remaining butter. Serve the beef over the noodles. You can thicken the gravy by pouring it into a saucepan and stirring in 2 tablespoons of cornstarch that has been blended with 1/4 cup cold water. Simmer until thick.